29 to 38 Inch Adjustable Height. 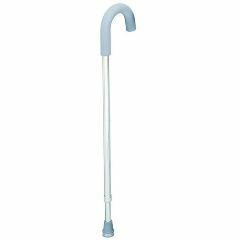 AllegroMedical.com presents The Sunmark Adjustable Standard Cane. sunmark Adjustable Standard Canes. Chrome, Scratch-Resistant Finish. Foam Handgrip. 29 to 38 Inch Adjustable Height; Adjusts in 1 Inch Increments. Made of anodized aluminum. Non-skid tips. Locking collar for added safety. Maximum Patient Weight: 250 lbs. Not made with natural rubber latex.